This superb introduction to the field of organizational psychology and organizational behaviour builds on the foundation of the highly successful first edition to provide up-to-date explanations of all the key topics in a clear, coherent and accessible style. The text is supported by numerous illustrations and examples as well as end-of-chapter summaries and concluding remarks. Topic sections on key research studies, as well as applied aspects such as human resources applications and cross-cultural issues, lead the reader through the complexities of the theory to its practical application. The Psychology of Behaviour at Work covers all major topics in the field, from vocational choice, personality, attitudes, motivation and stress, to cooperation, learning, training, group dynamics, decision making and leadership. Further sections introduce corporate culture and climate, as well as organisational structure, change and development, and a final section outlines predictions not only for the future study of organizational psychology, but of the future of work itself. 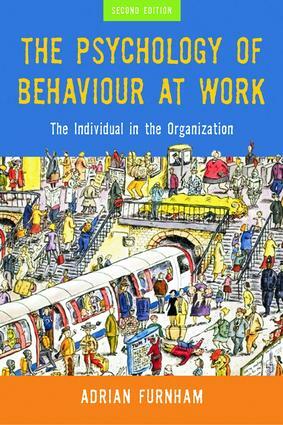 As with the first edition, The Psychology of Behaviour at Work will prove to be an invaluable resource for psychology students on work and organizational psychology courses, business students on organizational behaviour courses, and human resources managers eager to expand their knowledge of this fascinating field.